Sometimes a good idea seems to just spring from the ether. An idea that resonates with so many people that, when it is shared, it is embraced by all who hear it and so it spreads. That is what seem to happen when the idea of a pie party was mentioned on Twitter. As of an hour ago, it looks like 1500 people are baking, photographing and tweeting about pie. Everyone who thought for even a moment, embraced the idea. Pie is needed by all, and so pie it would be, all day, all the time. But for some of us, pie seems to be a bit more difficult. After all, when you can't use wheat flour, its just too hard to get a nice flaky crust, Right? WRONG! 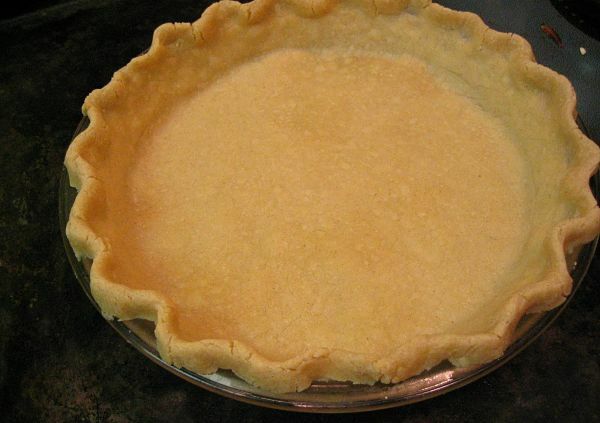 The gluten in wheat flour is actually what makes pie crust inflexible and tough. It is the pieces of fat, held cold until the heat of the oven makes them melt, and the moisture contained within a protein structure that create those lovely flakes. Gluten-free flours can make this physical chemistry happen just as easily as gluten full flour. Without the toughness! So, in honor of pie party, here is my gluten-free contribution. From my upcoming book, co-authored with Linda Larsen. Yippee, and watch me do the happy dance of joy that this book is manifesting just in time for Christmas. My nose has been kept firmly on the grindstone for the past few months with recipe creation, recipe testing, writing, editing and retesting the information. Thank goodness for the support of my family. They tested more recipes in a very brief time frame than I would ever have thought possible. And now I've got a couple of young food bloggers in the house! So, here for the first time in cyberspace is a pie recipe I created one deep winter's day from ingredients I had on hand in my pantry. If you would rather work with fresh heavy cream, just picked raspberries and sugar, feel free to make those substitutions. But you will need a couple of recipes behind the main one. First, there are two flour mixes used throughout the book to make baking as simple as grabbing a bit of this and a bit of that, like my mom used to bake. The first mimics the softness of cake flour with its high starch content. The second replaces an unbleached flour in protein and softness. I use these two mixes throughout the book in different proportions to create the perfect breads, pastries and crusts. So go ahead, make up a batch of each to test for yourself. And yes, the book is written in weights as well as cups, I love my scale and the accuracy and ease it provides while baking. White Gluten-Free Flour Mix Soft, white and tender, this combination of starches and sweet rice flour mimics cake flour. Whole Grain Gluten-Free Flour Mix For the whole wheat lover, who misses the more developed flavor of whole grains as well as the higher fiber and vitamin content. If you are like me and desire to use whole flours primarily, realize that you can substitute this flour blend- by weight- for the white flour mix at any time. The finished product will likely be a bit more dense, closer to the flavor of a Whole Wheat crust. A pie recipe I created one deep winter's day from ingredients I had on hand in my pantry. If you would rather work with fresh heavy cream, just picked raspberries and sugar, feel free to make those substitutions. 4. Add the milk, vanilla extract, salt, nutmeg and water, making sure to beat them well into the eggs. 5. 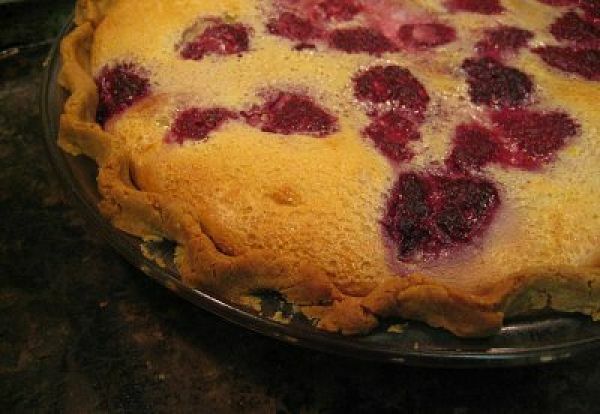 Scatter the raspberries into the pie pan and pour the egg mixture on top of the raspberries, allowing them to float to the top in the custard without moving them too much. If you do move frozen raspberries, then the custard will be tinted pink. If you want to use heavy cream and sugar, use 2 cups of heavy cream and one cup of sugar, simmer till the sugar melts.